We do not make reversible belts. 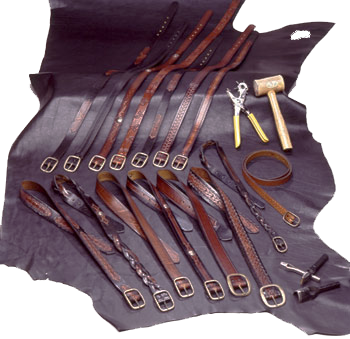 Our belts are one solid piece of steer hide with no lamination insuring strength, long wear, and durability. Belts are sized from the folded buckle end to the middle hole on the tip end. Thus a belt sized 32" is 32" to the middle hole, going back to 30" and up to 34". People buying gifts are usually safe buying according to waist size. If the waist size is unknown, we suggest that someone measure the length from the buckle attachment to the hole most used in a belt already used by the recipient and order the size closest to that measurement. A free generic buckle is provided with belt purchase. For other types of buckles, go down one size because the buckle itself can add from one to two inches to the length of the belt. We recommend that you wear our belts with dark clothing the first couple of times. The dye on the edges of the belt may come off on lighter clothing as the belt stretches slightly. This is only noticeable the first few times and not at all on darker clothing. We use vegetable dyes and it will wash right out. We suggest that these belts not be worn with fancy blouses or dresses.